“Are you intentionally out to give @UKIP an easy ride from a Christian perspective?” demanded someone called Peter Adams yesterday, in a terse Twitter response to the question: “Has Ukip sold its soul for €2million?” Mr Adams describes himself as a “Christian working in Intercultural & interfaith relations, peacemaking & reconciliation in Luton”, which is undoubtedly a very important job in a town where white Britons are now in a minority and Muslims constitute 24.6% of the population. But it is curious, once again, how a Christian can see the immense worth of inter-cultural peacemaking and the value of interfaith reconciliation, yet be unutterably blind to the significance of the cultural reality of Ukip and the need for the Church to interrogate its policies and engage with its supporters, instead of mocking, misrepresenting and casting them all out to the Ninth Circle of Hell to boil in the blood of those who built the Tower of Babel. The answer to the question is, of course, ‘No’: there ought to be no “easy ride” for any political party “from a Christian perspective”. It is incumbent upon Christians in a liberal democracy to discern party policy and weigh political integrity, and then to vote as the conscience leads – toward the mitigation of evil. Of course, some Christians believe they shouldn’t vote at all (“because Jesus didn’t”), but by doing so they abdicate their responsibility to be salt and light in the democratic world, and forfeit any right to complain when politicians get it wrong. Turning Mr Adams’ question on its head, it may be observed, once again, that there are Christians who are (intentionally) out to give Ukip (and its supporters) a particularly hard ride: just as clergy and bishops have viewed the Conservative Party since the Thatcher era with disdain, so Ukip and the rise of Nigel Farage represent a particularly odious “blot on the political landscape” (to use the Bishop of Willesden’s phrase), which, as with Margaret Thatcher, quotes Scripture like the Devil and cloaks evil in light. Such antipathy stems rarely “from a Christian perspective”, but more their own political bias to which they are frequently blind. It’s not so much the Bible they bring to bear, as Scripture skewed toward the ethical socialism of RH Tawney, channelled and sanctified by William Temple, and neatly codified by the Fabian Press. There was a long pause in the Twitter space-time continuum. Except, of course, when it is Ukip that is assessing the entitlement. If that was a considered response, we must be grateful that the Bishop’s nuanced grasp of the welfare state – and the complex relationship between immigration and poverty, ill health, illiteracy, poor housing, unemployment and alienation – wasn’t condensed into half a tweet. But we observe in both responses the generous inclination to examine Labour’s motives and a desire to understand political “signalling” – often called “dog-whistling” – and to do so from a philosophical perspective of society and community, if not with a Christian consideration of the need to protect of the most vulnerable with a sympathetic understanding of the difficulties in tackling the problems. Every single piece of legislation on immigration has been criticised by bishops of the Church from the early sixties onwards. Archbishop Michael Ramsey, for example, was a strong public opponent of the Labour Government’s 1968 Immigration Act. The opposition was rooted in moral and religious concerns. The legislation was seen as a thinly disguised attempt at restricting coloured immigration. The use of the concept of ‘patriality’, which in effect gave access to Britain to white people from the Commonwealth and kept at bay Commonwealth citizens who were black, was seen to be particularly offensive. And so it was. And so the Church of England teamed up with the Roman Catholic Church, the Church of Scotland and the Free Churches to oppose the Act – to no avail. We have come a long way since our immigration policy was formulated on the basis of skin colour. 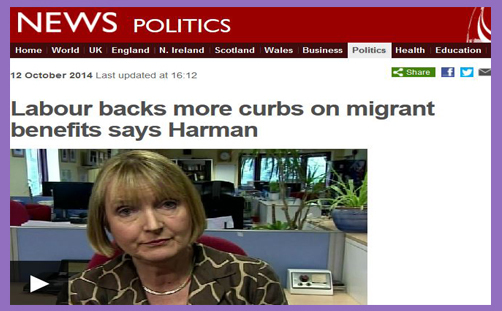 Now no major political party (and surely, by all measurements of political influence or social presence, that includes Ukip – for good or ill – ) sees it as moral to oppose immigrants because of their skin colour. They do, however, all seek to control it (or pretend, within the open borders of the EU, that they can control it). But it is not a racist pursuit, because immigrants are not assessed by their skin colour or ethnicity. Indeed, Ukip favours increased immigration from the Commonwealth – including those with black or brown skin. The clergy and bishops of the Church of England are charged with acting as the conscience of the nation. They cannot do that – or are substantially hindered from doing it – if they act or speak in a crudely partisan way by posturing or propagating the myth that the British political right is nothing but an obnoxious pressure group obsessed with narrow conceptions of nationhood, nuclear missiles, miners’ strikes, Muslims and monetarism, to the detriment of community peace, societal reconciliation and collective obligation. Perhaps the lefty clergy and bishops might be trusted or respected more if they were wise, disinterested and better inclined to take account of the merits of the argument rather than making terse, hasty and ill-reasoned interventions ad hominem (or ad Ukipem). Has Ukip sold its soul for €2million?